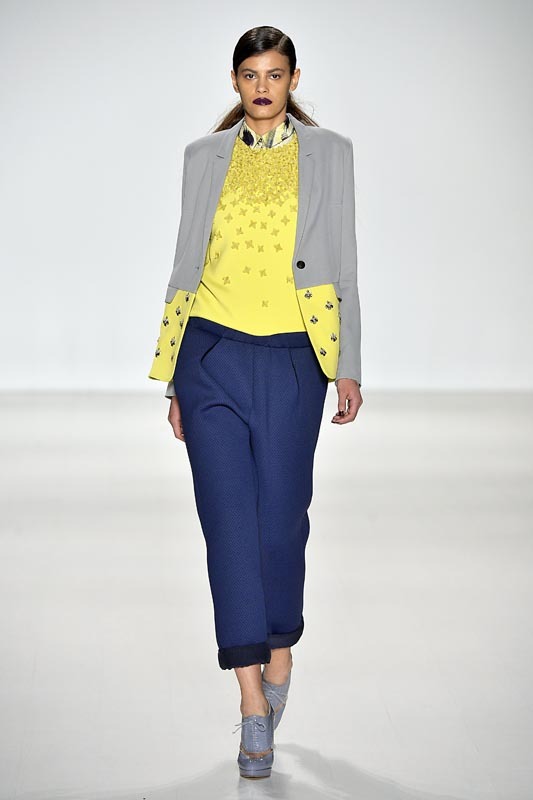 The fashions were chic with a breezy side at Noon By Noor Fall 2014 at MBFW. Design duo Shaikha Noor Al Khalifa and Shaikha Haya Al Khalifa’s showcased a cohesive collection featuring sportswear and flashier pieces sprinkled with embellishment. From soft tonal solid nuances to a patterned mix with all-over prints, the collection reflects a unique finesse. The collection is young, developing, and reaching for its identity – a good sign. The fusion of modern shapes and mixed patterns is prominent as with most with young designers in Noon’s story this season. Still, there were enough shiny inserts in this collection to make us think, hmm… is this heading in the direction of a dress collection? Our eyes weren’t sore from seeing the rather big statement and striving to reach both styles. But we can’t help but think, are shiny dresses the direction a young designer needs to take to get a little space on the floor? Light and lively as sheer numbers with crystalline embellishments take the look from naughty to nice, with peak-a-boo placement coming across as charming. Cream, mauve, and light grey are daintily romantic in flowing configurations. The palette is transformed by tailoring for structure and deepened with darker shades like plum and navy. Patterns ranged from organic cloudlike shapes to two tone circles in repeat. Fabrics for the season like wool and houndstooth were appropriately layered as outerwear played a meaningful role in the selection. Dark lips and side parts help to keep the look clean with a touch of drama. Under the wings of Kelly Cutrone and the peoples rev team, this brand is getting a close look, and we’re watching. Some fabrication details need refining, but we’re loving the overall view so far. FDM LOVES NOON BY NOOR. Commentary and selects by Brigitte Segura, written by Sarah A. Freiseis.